Here's the thing. A lot of people act like grammar doesn't matter. Punctuation is optional, and if one exclamation point is good, more are better. You can get away with that when you're tweeting or texting, or even e-mailing. I will confess to being profligate with the exclamation points in e-mails. (Not in tweets. You don't have the space.) But when you're writing something for publication--even if it's just a Letter to the Editor of the local newspaper--you flat out have to pay attention to your language, including spelling and grammar. Grammar was invented so we could understand what we're talking about. I can understand you and you can understand me. The different verb tenses tell us when something happened. The order the words come in (English, being a word-order language) tells us who does what to whom. Apostrophes clarify things--They're sounds like their or there, but it sure doesn't mean the same thing. When you leave out all the punctuation, it makes it hard to tell what you are trying to say. That old "Eats, shoots, and leaves," conundrum. Or "I'd like to thank my parents, God and Mother Theresa." About half the letter writers are clear and concise in what they're trying to say, and correct in the way they are saying it. The other half...not so much. It's not that I don't agree with what they're saying--I tend to disagree as often with the grammatically correct writers as with the ungrammatical ones. And actually, the letters that wander all over the place and don't seem to have a point--or one they actually reach--are sometimes grammatical. More often, however, I'm left struggling to figure out what they're trying to say, and just where I ought to put the periods and commas. There are the folks who leave out every bit of punctuation altogether, and those who throw in periods and commas at random. I often have to remove excess exclamation pointage. The newspaper won't let you have more than one. And sometimes the copy editors take those out. (I don't.) As for apostrophes--those tend to be pretty random too. I had one letter recently in which every word with an "S" on the end of it got an apostrophe. (Or a "comma to the top" as some have put it.) So we had toe's and book's and kudo's and top's. Then there are the annoyances that have slipped through from e-mail. We get the majority of our letters to the editor via e-mail these days, which really is convenient. We can copy, paste and edit, rather than having to type the whole thing in. However, those e-mail-isms remain. People leave out the articles--"the" and "an" and the like, which I then have to put back in. They use all caps for emphasis. Sweetie, if you can't use emphatic verbs and nouns, you're sunk, because the newspaper isn't going to leave those all-caps words in. In fact, if you do excessive regular title-style capitalization, I'm gonna take it all out. And it's a pain to go through and lowercase all those words. A serious, major pain. So, some of my whining is due to actual grammar issues. Some of it is due to newspaper style issues. I just wish people would realize that writing for publication isn't the same as writing an e-mail. Sigh. And I really, really wish I could leave in all the misspellings (House of Represintatives!) and bad grammar (count your toe's!) to illustrate just what idiots some of these idiotic letters come from. But I can't. Sigh. 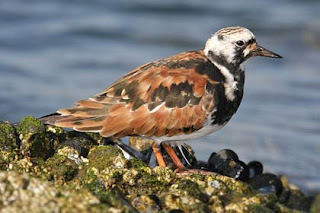 In other news, there are ruddy turnstones on the beach. I usually see them earlier in the year than this, but I've been late getting back out on the beach. I also saw a pair of laughing gulls courting. The males and females look exactly alike, except the males are slightly smaller. The male was following the aloof-looking female around, touching her beak and giving off a periodic squawk--er, plea. He looked pretty dandified and worthy to me, but what do I know from hot-looking seagulls? Their beaks were Very orange--the others had more blackish beaks. Makes me wonder if, besides getting sleek black heads during the courtship season, the laughing gulls get bright orange-red beaks... Have to look it up. And no, I haven't written anything this week, yet. Sigh. But I think I've decided which scene needs to come next, and to leave out the one I was thinking about. It was probably good that I let it ride, so I could let the swamp have the story and figure out whether or not I really needed that scene. The story will work better without it, and it will get me closer to the end sooner. So. It's been a long time since I've laughed as hard as I laughed this afternoon. At the dayjob, I work in a large open room that is fairly empty. The regular denizens are three reporters who are in and out, an editor/reporter, and me, the lowly peon. I sit across the desk from the editor, who only recently was promoted from the copy desk to doing his reporting/editing thing. Previously, he was in charge of the section I do, and we worked very closely together. He's still my "go-to guy" if I have a question about whether something belongs in my section. He's English, about 5 years older than I am, and wears a coat and tie to work every day, whereas most days I dress pretty much like I am now--a nice T-shirt, good jeans, and a jacket (because it's freakin' cold in here with the a/c cranked up way too high). He also has a Wicked sense of humor and is a lot of fun. But he's English and wears a coat and tie every freakin' day. So, today--the Brit-across-the-desk spotted one of the "back room guys" (I'm not real sure what he does, but maybe something to do with the computers) wandering across the newsroom in his direction. He said "Oh no, B--'s looking for me." And vanished. I'm thinking "Oh no, he did not just duck down to hide underneath his desk." But obviously he did. He had to have. There's no place else in this big open room for him to have gone. And I started laughing. Meanwhile, B stopped to talk to one of the reporters. Next thing I know, he's come around the end of the desk nearest me, and I see him crawling on his hands and knees--this fancy-talking English guy in his tie--past my trash can. And I'm laughing even harder. The guy who'd come in to talk to him finally looked around as he walked closer to our corner of the room and decided--hmm, the Brit's not here, might as well leave. But about this time, our Brit decided he couldn't escape, so he popped up, like he hadn't just been crawling back around to his side of the desk. He said later, when I'd recovered from my laughing fit and we were talking about it, that he probably could have said he'd always been there, B just couldn't see him. If he'd done that, though, I really would have fallen off my chair and been rolling on the floor, laughing. And then I'd have had to get up again, off the floor. So that was the day's excitement. That, and --I have my computer back! And I finally managed to get my e-mail set up so I don't have to go out and look at the webmail, which is nice to have, but hard to work from. I'm happy. I still have to find one of my programs--which I could swear was on top of one of my desk boxes, but I can't find it now--to reload. But I have Office, Quickbooks, the print thing and my Sony Reader Library loaded. I need to reload Calibre too. There was something else I was going to say, but I can't remember what it was, so I'll just stop there. What's tickled your funny bone lately?? It's depressing how many things are still broken in Galveston since Hurricane Ike hit more than a year and a half ago. Don't get me wrong--a lot of stuff is fixed, the city is livable. It's even a fun place to be. But people are just now getting FEMA money to fix their houses. The city's just now suctioning out all the sand and debris left by Ike in the storm sewers. And--well, the stop lights are still barely working. They have been working on duct tape and hope ever since the storm, and every time there's the least little bit of moisture in the air, sundry traffic lights go on the fritz, leading to long lines of traffic doing the four-way stop thing. There where the freeway ends, Broadway also has two turning lanes to the county courthouse, so it's 8--no, 9 lanes across. (There's an extra lane added on the "outbound" side to send two lanes down the access road.) So it's a Huge Intersection, with a light. Today, that light was out. It had sorta rained earlier. Pathetic, pitiful rain--more like mist, really. Or like really, really thick humidity. But that was enough moisture to knock out the stoplight. So, of course, the traffic backed up. It wasn't too bad--probably wouldn't have been as bad as it was, except they'd blocked off the inside lane, I think to mow the medians, or some such. Anyway, what I'm getting at is that most of the traffic lights on the island were damaged in the hurricane. They have them working--sort of. But every traffic light in the city needs to be rewired and replaced. Galveston is supposed to be getting some federal help in doing it, but that help is very, very slow in coming. The fact that the economy collapsed the month after the hurricane hit didn't help any. We're still the city the country forgot. Sigh. But we're hanging in. Bit by bit, the city is getting put back together. Oh, and that house hunting thing? The banks aren't being cooperative, so we're going to wait a while before we move. Stashing more money. I also need to sell another book. Which means I'd better finish the one I'm working on. And I didn't write a blessed thing today. I did however, finally get my computer put back together. Now I have to go reload all my programs. I read this month's book early in the month, unlike last month. I'm actually doing pretty well in my challenge reading for this one. Last year, I think I'd given up by this time. (Yeah, I know. It's only the 4th month. *hangs head in shame*) But I'm keeping up this year, so far. I'm not sure how I'm doing on the topics, but I am clearing some books out of my stacks/shelves. So, this month, my book was THE QUIET GENTLEMAN by Georgette Heyer. This was a nice quiet read--despite the fact that there was a mystery in it. The Gentleman of the title returns home from the wars. He's inherited the title after his father died-apparently his mother ran off with a footman, or some such, then quickly died, so dad could re-marry. Since the new earl (or whatever) resembles his mother a great deal, Dad never liked him, and when the oldest son went off to fight Napoleon, everyone hoped he might just, accidentally, of course, die, so the younger son, by the second wife, could inherit. But he didn't, and now big brother's come home to take up the reins. And none of the family--especially his younger brother--is happy about it. There's a cousin, and a neighbor's bluestocking daughter who's staying for a visit while the parents are away, and the stepmother, and another very pretty neighbor who's something of a flirt. The younger brother's had his eye on the pretty neighbor, and when her head is turned by the new earl's showing up, little brother has a temper tantrum or two. Then the earl is warned away from a dangerous bridge. And he flirts some more with the neighbor, and bubba has another tantrum. And they go to a party, and have a party, and somebody shoots at the earl, and--well, it's a nice little story, and truthfully, not as exciting as it sounds here. I enjoyed it, but there were large stretches where nothing much happened. Often I enjoy Heyer's "nothing much," but this seemed like less "much" and more "nothing" than I usually get in her books. It poked along a little too pokily, maybe, than what I prefer. Or maybe it was that we got so very, very little of the internal goings-on of the Quiet Gentleman and his family. I prefer to get a lot of what's going on inside peoples' heads--more emotion and thoughts and such, and we don't get a lot of that. I think some of it is deliberate, so that the happy ending is more of a surprise--but I don't read romance for the surprise. I read it for the journey. So, while I liked the story overall, it's not one of my favorite Heyers. This has not been a recent issue. My annoyance dates back at least as far as the series premiere of the old television series Dallas. When they had the main characters cowering in WACO for fear of a hurricane, you KNOW the writers do not have a CLUE about much of anything having to do with Texas. FYI, Waco--where I was living at the time with my brand new spouse--is more than 300 miles from the coast. When evacuating for a hurricane, Waco is where people go to be safe. (My son went to Waco to visit his girlfriend when Hurricane Ike made landfall in 2008. I didn't go that far...) When we lived in Waco, we liked hurricanes, because they usually meant rain, and most of the time, we needed rain. I'm feeling particularly grouchy today, because I have bumped into more than one instance of gross Texas ignorance in the past couple of days. This ignorance has nothing to do with the way outsiders see Texas as one giant monolithic mass of redneck Republicanism--which it most definitely is not, but that's beside my point today. I'm talking about the kind of ignorance that is easily solved by Picking up a map. Or Asking somebody. Or checking out a government website, or a high school text book. Simple research. For instance, I have already mentioned the book in which the Texas State Football Championship (A, AA, 3A, all the way up to 5A) is played in the school's home football stadium rather than in the capital city of Austin. All that author had to do was to ask on any e-mail author loop she belonged to: "Hey--where's the state football championship played?" and there would have been an author from Texas who could tell her. There are always authors from Texas on any writing loop, because it's a big state, there are lots of people here, and lots of us write books. Ignorance has no excuse. The book I read today--isn't actually wrong. It's just Vague. Which isn't a sin. I blame the vagueness on New Yorkers. Because I know this author personally, and I know darn well that she knows that the city of Galveston is on an island. An island that is over a mile from the coast of mainland Texas. You can't really swim your horse across, even if large parts of it are no more than 4 feet deep. But she has her Texas Rangers riding a day south of the city to a little ranch without ever showing them crossing water. 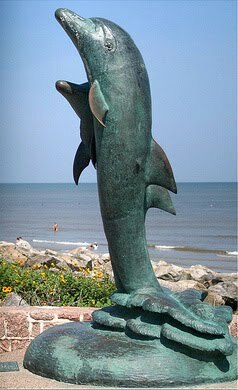 Now, in 1859, the city of Galveston was confined to a small section of the east end of the island, which stretches 30 miles to the west (southwest), and it takes about a day to ride that far, so they could have ridden to the other end of the island and confronted outlaws there. Outlaws that somehow got over to the island themselves... On the other hand, she referred to riding South out of the city. Here's another thing. If you go south from the port of Galveston, you cross the island the short way and wind up in the Gulf of Mexico. After much confusion (since, after all, I live in Galveston), I finally decided they must have crossed over somehow, and ridden south toward Matagorda or Freeport or somewhere inland. Those places are south, but they are also west. I also got confused when her people rode past Galveston on their way to somewhere else. If you're inland, and you're going somewhere else further inland, there is no way Galveston is on the way. It's pretty much not on the way to anywhere. I blame that on the copy editors as well. I think a large part of my confusion with this story was due to the fact that I couldn't place the heroine's home ranch or the outlaw's hideout anywhere specific, so I couldn't visualize where these people were riding around. And that was my issue. Someone who hasn't traversed that same territory every couple of weeks wouldn't have had a problem at all. And the author did once mention leaving Galveston on barges. Late in the story. Still, it was annoying when I kept wondering how these people got off the island, and the fact that it IS an island was never, ever mentioned. Is it general knowledge? That Galveston is an island??? And then there was the Criminal Minds episode this week. Besides the fact that the Texas border with Mexico is a RIVER along its whole entire length, which makes the digging of tunnels under the border a little problematic, seems to me, and the fact that Terlingua, Texas isn't actually a town, anymore--I'll let them get away with that. People make up towns all the time, and Terlingua used to be a town. That's okay. The tunnels were silly--did nobody think that there was a river in the way? But, that wasn't the big issue. See, a large part of the motivation of the villain was that the sheriff just moved down from New York City and got hired as the sheriff. She came in as an outsider and took over, and the villain, who grew up in the town, was jellus. Problem is, that would never happen. Because every sheriff in every one of the 254 counties in the state of Texas is ELECTED. And no outsider could get elected. Now maybe, if the previous sheriff died in the saddle, so to speak, the Commissioner's Court, or the county judge (who usually isn't the judge of a court, but the administrator of the county) could appoint somebody as sheriff, but that appointment would only hold until the next election, and since just about every office in the state of Texas is elected, there are elections every five minutes--or so it seems. Which made the major conflict in the story, or one of them, well--silly. And impossible. So, those of you who are not Texans or ex-Texans who might be considering setting a book in Texas-- just remember. If there is a public office or government position that might be elected, it probably is. We even elect the county treasurer (if there is one) and the tax assessor/collector. We elect county clerks and constables and justices of the peace. I'm really surprised we don't elect the county janitors. Oh, and it's not the sheriff's station or sheriff's department. It's the sheriff's office, for both the location and the organization. Really, people--just do your homework. Don't assume that all states work the same. 'Cause they don't. Oh, and when you get your map of Texas to use in plotting your story (I do recommend using maps--it makes things so much easier), do pay attention to scale. It's farther than you think it is. I was waiting to write/post this blog until I got my wildflower pictures downloaded from my camera. But my computer is still in the shop, and while I could climb over the boy and use the back-up in his room, it's a real pain. So I haven't downloaded my pictures. I'll borrow one from the dayjob photographer. Jennifer Reynolds is much better than I am. And yes, bluebonnets do come in pink. Anyway, I went up to Valley Mills, TX to "camp out" and write. I actually went up to do a workshop on using Tarot to spark your writing, but that was just for several hours on Saturday. I drove up on Thursday and stayed till Sunday. We wrote, hashed out plot issues, talked, ate salads and chocolate cookies, took a walk to look for wildflowers--didn't find the big field out where we stayed, but we found some others--and wrote some more. It was wonderful. I got a sticky point figured out. I knew, sorta, what I wanted to have happen at the end of the story. Problem was, given the date where I started the story, the actual historical events didn't cooperate to create one of the endings I wanted to write. I just couldn't drag out my hero's assignment three weeks longer than it ought to be, to make them do what I wanted. So, I had to re-read my research book and see what my timeframe was and what I could to do wrap things up. And I did. I've got a handle on things now. And I'm closer to the end than I thought I was. All through the benefits of talking things through with critique/plotting partners. Oh, and I wrote about 12 pages while I was there. So I'm very happy. :) I haven't written so many pages since I've been back. I've been Really Tired. I'm doing some re-reads of historical novels I liked a lot, and reading some new ones. Trying to read the Rita finalists. Need to pick up more of them. And we're out of breakfast food. Since I'm the only one in the house who eats breakfast, this means I need to go buy myself food. Somebody else has written an essay on something to the effect of "What makes bad books bad." I haven't read it (yet), but since I was trying to come up with a topic to write a blog about, I thought I might write about that. Because there Are things that make bad books bad, generically speaking. However, those books are bad enough that they don't usually get published. (Hopefully, anyway.) I'm talking about books with bad grammar, or "fishheads," (also known as backstory dumps at the front of the book). There are manuscripts out there that detail Every Minute of the Character's day. Taking a shower. Eating breakfast. Walking on the beach. Driving to work. Now--walking on the beach can be fascinating in real life, obviously. I've written way too many blogs about it (probably). But in a book--if your character is going to walk on the beach, something has to happen on that beach that will change the story. He has to find a body washed up on shore--maybe tangled in the tentacles of a Portuguese man-o-war, but the jellyfish isn't what killed her. Or she needs to kiss the hero. Or fight with the hero. Or make a confession of some kind to the hero. EVERYTHING that happens in a story must be important to the story in some way. But what drives one person crazy (me) might be what another person loves about the book. So I'm just going to talk about the things that make it hard for me to finish a book, or have me arguing with the author/characters. One of the things I've already mentioned: Nothing happens. I remember reading a historical romance--a traditional Regency, if I recall correctly--that opened with the heroine wandering over the hillside pondering the recent events in her life. I stuck with it, but it didn't improve much. The pace remained abysmally slow. Which is kind of the same thing. Slow pace = nothing happens. Some slow paced books can work, but mostly, they just aggravate me. Ponderous, purple prose. That annoys me. Sometimes it's not even purple, just ponderous. Stilted. Like they think authors are supposed to write in lofty language. That works for Georgette Heyer. Barbara Metzger can do some very interesting things, playing with Heyer-ish language. Others--not so much. There are some authors who write mostly in that lofty tone, and then the characters will suddenly use slang. Or think in slangy, contemporary language--when they haven't been for 2-1/2 chapters. That's another thing that can drive me bonkers. Inconsistency. If you're going to use a historical-feeling tone, then use it. Don't jump back and forth. Characters need to be consistent too. Obviously, emotions can change, but I'd like to be able to follow the change. You can let your characters do whatever they must--if it's motivated. Too many unpublished authors (I've judged a lot of contests) don't get enough internal thought, emotion and reaction into their stories, so their characters seem flighty. Unfortunately, there are a few characters in published books who don't make a lot of sense. I want to be able to follow the character's thought process as they make a decision. Not a bunch of wishy-washiness, or hand-wringing, but what they think, and why, and how they move to this decision, whether it's a major change of heart or simply an important decision. There are other things that make me crazy--poor historical, or even contemporary research. (IE. A state football championship in Texas that is played in the school's home stadium. Excuse me? Even the 6-man football championships are played in AUSTIN. (The state capital) ALL championships-whether sports, music, academic--all of them are Always in Austin. Period. And it ain't that hard to find that out. Geez.) (Okay, the UIL Solo & Ensemble State competition for band and choir musicians is in San Marcos for 1A schools--but San Marcos is only a little ways south of Austin.) Bad research can throw me so far out of the story, I'm arguing with the author in absentia for hours. And then there's the language that isn't bad, but has no spark to it. It's just--well, dull. On the other hand, it could be argued that some of these things are just my subjective taste, like my mild distaste for vampires and pirates. (A vampire story has to be really good, and probably different, for me to like it. Same with pirates.) On the other other hand, I'm always willing to give a good Western, or werewolf/shapeshifter, or marriage of convenience story a try. I'm willing to recognize my prejudices and subjectivity in those areas. My disposition against slow-paced stories falls in this category, I think. What does annoy you when you're reading? What kinds of things will make you set a book down and not pick it back up? I'm not necessarily talking throwing-it-against-the-wall, though you can share those too, if you want. I'm leaving town this afternoon and won't have Internet access way out in the wilds outside Valley Mills, so y'all play nice. :) I'll try to check in before I go. That's right, folks. Today, I went out to walk on the beach for the first time in 2010. It's been really cold, and then it's been wet, and I've been lazy (and enamored of my new Wii & its Wii Fit game), and it's taken all the way to APRIL to make it out to walk barefoot on the beach. Okay, I haven't walked barefoot much before April in any of the years since I've been here, but I've been out with shoes on. It's just been a cold winter. By that, I mean that the sand hasn't reached high on the seawall, the giant pink granite boulders in front of the seawall were exposed, and often awash in water when the tide was in, which meant you had to pick your way through the rocks to get to the next jetty and cross over to a wide, high beach with the boulders all covered up. But today when I arrived and climbed down the stairs, I scarcely recognized it. The parks people (and maybe the Corps of Engineers too) had brought sand in and raised the beach level, covered up all the boulders and moved the waterline out where it didn't lap on the bottom of the stairs. So I had to cross about 30 yards of very soft sand to get to the hard, easy-to-walk on part. Not many seagulls or other birds out this a.m. I don't know whether I was too early for them, or too late. I did, however, see lots of critters that got washed up on the sand. The saddest were the four dead willets I saw spaced along the length of the beach where I walked, like some sandpiper mama had lost so many children just as they were learning to run and forage along the water. Poor birdies. I also saw 10 (yes, ten!) clear/white jellyfish washed up on the shore. 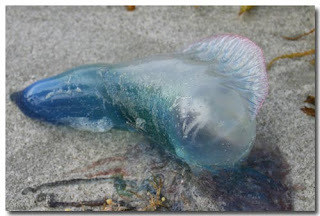 I've been rummaging through the Internet trying to figure out what kind of jellyfish they were--they're the big (cantaloupe sized) clearish ones that look like abandoned plastic bags from a distance, and don't have long dangly tentacles. Either that, or all their tentacles had been broken off, but since I also saw a bunch of Portuguese man-o-wars (men-o-war? Is that proper for jellyfish (even though the man-o-war is apparently technically not a jellyfish-something I learned in my rummaging) terminology? ), and they all still had their purple/blue tentacles trailing across the sand, I think the big clear jellyfish must not have long tentacles. I did not know till my research today that the oblong purple/blue/teal jellyfish (see picture) are actually the man-o-wars, and the big clear ones aren't. I've been stung by the clear ones, and it hurt like crazy--but the man-o-war is supposed to be worse. Maybe. I've been stung by jellyfish I didn't see, and it sure hurt, so it might have been a MoW... I think the clear ones might be Sea Nettles--they're not Cannonball Jellyfish, because they are colorless. I am still researching. Maybe I will ask our neighbor. He's a marine biologist, I think. I'll try to get another blog in here before I leave town, but I'm heading up to Valley Mills, TX to a writing retreat, just me and my friend B, on Thursday. We are going to stay at the usual dude ranch (it is mostly ranch, very little dude), and talk and write. I can't wait! Hopefully I can solidify how my book needs to end. It's Friday, and what day is more foolish (isn't that the adjective that goes with folly?) than Friday? At least it's alliterative. Although I'm not going to write about folly today. This is going to be a Random Stuff blog. 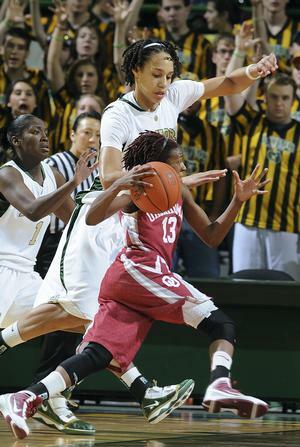 We are not going to San Antonio to go see the Baylor women's team in the Final Four of the tournament. Even if it was the men's team in the finals, we wouldn't go see it. If they're in the finals next year, in Houston, we might go. But we are excited, and will watch them play. Go BEARS!! Anyway, the Boy couldn't remember exactly how to get to Gilhooley's. A large part of the problem was that there are a lot of Farm to Market roads on the Galveston County mainland with similar numbers--1765 and 1764, as well as 517, and 519. And the Boy couldn't remember whether they'd gone down 517 or 519 to get to the place. We finally had to call and ask. (It's on 517, just FYI, in San Leon.) But they did have some excellent oysters, and while I didn't order a whole dinner-full of oysters, I did allow myself to be persuaded to eat one. (The menfolks ordered a dozen each--and received 14 and 15 oysters each, in all.) And it was the first oyster I've ever eaten that I actually rather enjoyed. It was extremely soft and fluffy-but I don't really mind that texture. It tasted mostly of woodsmoke, but darned if it wasn't pretty good. I'm not sure I can be persuaded to eat a whole dozen of the suckers, but one at a time, it was definitely edible. In other matters--I have written Eleven pages for this week. That's the most I've done in a while, so I'm happy. I only looked at one house this past weekend, and it was so much more suitable as a duplex than anything, it really wasn't worth posting about. Still haven't heard from the bank, so we're not looking hard yet. And since the government let the flood insurance program expire and haven't got round to re-upping it yet, it may be a while. We have a new fence, on one side of the yard. The fence in the back was already replaced, shortly after Ike. The fence on the north side is still in good shape. The fence on the south side was rotting and had to have boards screwed over it to keep the granddog from biting holes in the rot and escaping. So now we have a new fence. The fence guys came at 7:30 a.m.! It wouldn't have been a problem, except I was bad the night before and stayed up reading till 4:30 or so, and was Very tired at 7:30. I let them move my vehicular beast from the driveway, and stayed awake long enough to eat and take meds, and walk the dog. But the fence is done.